So here is my packing list as promised. A must for any travel blog. I love reading these, they are so additive and many of my friends who travel seem to agree with me. In 2012 I took my 65 litre to Africa to climb Mount Kilimanjaro. I took loads of stuff I didn’t even unpack, and we rented all the gear anyway, really cheaply. Apart from the climb we only stayed in three hotels and were driven between these so it wasn’t too bad. But I still got fed up with my pack. I have read more ‘packing light’ blog posts than I can count. I have deduced that if you buy a small pack, max 40 litres I’d say, then you can’t take much due to space. Also don’t pack things ‘just in case’ you can buy EVERYTHING and I mean that, worldwide. I saw Head and Shoulders and Colgate in Tanzania, as well as many more brands, extra socks, any type of clothing, everything. For women it might be a little different for toiletries in rural areas but basically don’t be a Boy Scout and try and be prepared for everything. Carry on only: I will be going carry on only for the first time. I cannot personally claim to have experienced the merits of this as I have never had trouble collecting my checked in luggage, but the idea is that you can get off the plane and off you go. No waiting around. This means no pen knives and only carry on liquid sizes. If you need it, buy it when you get there, full stop. I have a 35 litre pack and it weighs about 7kg when packed. My list is below. Some people’s blogs guide you through exactly what to pack. But I will just say; firstly you should shop in your own wardrobe before buying any technical gear. You can mostly wear normal clothes anywhere, just research the country and find out if you need long sleeves, trousers for modesty, jumpers for the evening, gloves for that cold morning hike you’ve planned etc. My bag is a 35 litre Lowe Alpine Eclipse and is in the ‘trail running’ section of their website which means it is very light, less than 1kg. It also has a hip belt to take the weight off your shoulders, something that is not common on most bags that are 35 litres or less. Seems like a lot but it all fits nicely. 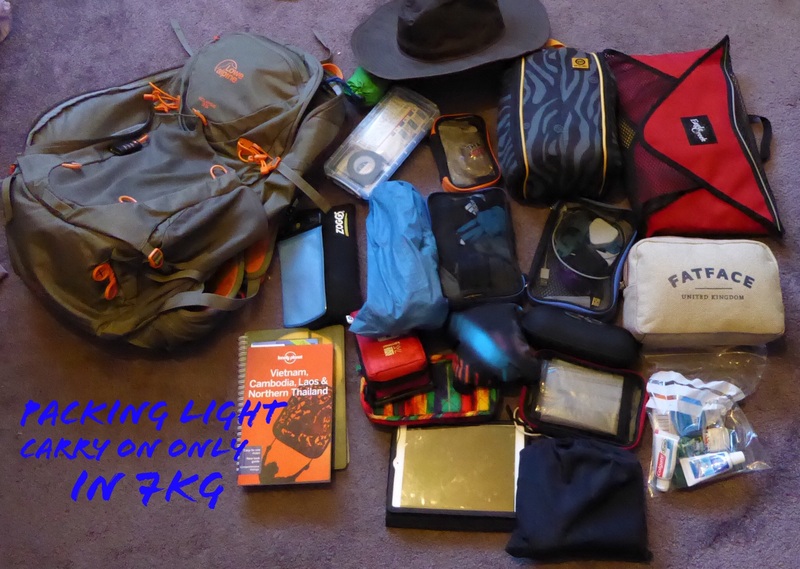 Not much room to expand though… I organise it all in packing cubes, see picture below. Not pictured is my camera, blue north face waterproof and my jumpers which I will be wearing on the flight. I may do some posts later on reviewing some of my gear. Check out this post for my itinerary for the first week. That’s all for now folks. Related posts: lightening the load – stuff I posted home – packing light update. I’m looking forward to more updates while you are away. Haha, I may not have seemed enthusiastic about reading your packing list – any packing list – but actually it made compelling reading! Can’t wait to read your blogs. Bon voyage Jeff. Haha I’m glad you approve. It is certainly the staple post that all travel blogs seem to have. Keep an eye out for lots of pictures of temples…. Thanks 🙂 I hope that proves true when repacking every other day in various hostels…. I’ll be honest Jeff – I worry that you are not taking enough socks. I liked this- especially seeing how you started with a huge pack and have scaled down gradually- I wonder how many backpackers eventually do this? I enjoyed seeing what items you considered or took and then scratched off your list too :-). I started looking for a way to pack that mixes my hiking/camping in with other travel, and am gradually getting there :-). How much changes in a different climate? Thanks! Thanks for your comment. I’m glad you found the post useful. I will be updating it again soon and also writing a post about what I sent home in the mail. Keep and eye out for it! I find not a lot changes with different countries and climates. This is because I layer all my clothes when it gets colder. I think for Asia, Africa and the Americas you can go for minimal clothing, light and cool and just layer for cold weather. For Europe the same but throw in an extra jumper and pair of long trousers. Then for snowy countries you need some technical gear like a down jacket and good waterproof but pick ones that pack down really small in stuff sacks. And then you need socks and gloves for Europe and any colder countries (but only sandals for Asia etc). The pack I have is good for hiking as well which is useful as I often do treks or day camps while traveling.